U.S. President Barack Obama issued a cautious warning Friday that Syria's reported use of chemical weapons could provoke international intervention in the country's ongoing civil war. U.S. President Barack Obama issued a cautious warning Friday that Syria's reported use of chemical weapons could be a "game changer" that could provoke international intervention in the country's ongoing civil war. Both U.S. and Israeli intelligence claimed this week that Syrian armed forces have used chemical weapons in its battle against insurgent forces. Obama had previously warned that chemical weapons represented a "red line" that could provoke a strong military response if crossed. Although U.S. intelligence reports Syria may have crossed that line, Obama did not commit to any specific action. "We have to act prudently," he said. "We have to make these assessments deliberately. But I think all of us ... recognize how we cannot stand by and permit the systematic use of weapons like chemical weapons on civilian populations." Syrian officials denied using any chemical agents, saying it "did not and will not use chemical weapons even if it had them." Canada's Foreign Minister John Baird said Friday that he finds the U.S. and Israeli reports credible, and wants to see a full UN investigation. British Prime Minister David Cameron said the news was "extremely serious" and backed Obama’s stance that the international community must respond if the reports proved accurate. Baird was noncommittal about a military action, but expressed concern over the accusations and said Canada would work with its allies to agree on a response. But U.S. military intervention now looks inevitable says Fawez Gerges, professor of Middle East politics at the London School of Economics and Political Science. "I believe that the U.S. now is preparing the ground for military action," he told CBC News. "This is a matter of when, as opposed to if. What we have seen in the last 24 hours tells me that U.S. will most likely decide on military action in the near future." In the Syrian capital Damascus, a government official instead accused opposition forces of using them in a March attack on the village of Khan al-Assad outside of the northern city of Aleppo. Both sides have accused each other of the deadly attack. The official said the Syrian army had no need for using chemical weapons "because it is capable of reaching any area in Syria it wants" without them. He spoke to The Associated Press on condition of anonymity because he was not authorized to give official statements. Sharif Shehadeh, a Syrian lawmaker, said the Syrian army "can win the war with traditional weapons" and has no need for chemical weapons. Syria's official policy is not to confirm nor deny it has chemical weapons. Shehadeh called the U.S. claims "lies" and likened them to false accusations that Iraq possessed weapons of mass destruction — a claim U.S. policymakers had used to justify the invasion of that country in 2003. "What is being designed for Syria now is similar to what happened in Iraq when Colin Powell lied in the Security Council and said Iraq possesses weapons of mass destruction prior to the U.S. invasion and occupation of that country," he said. 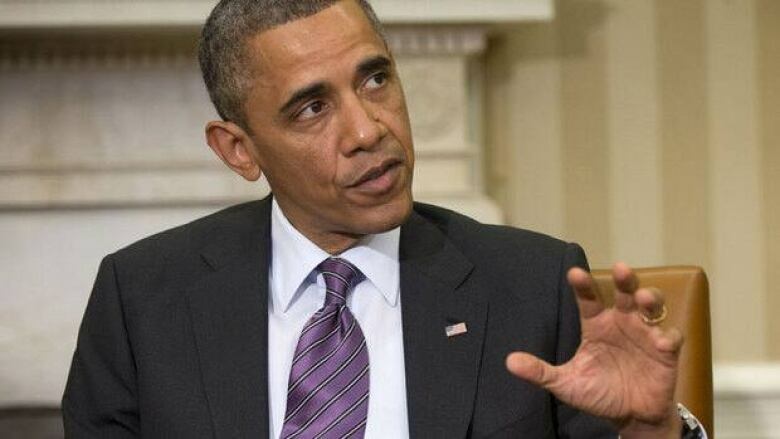 U.S. President Barack Obama has said that the use of chemical weapons would be a "red line" that could result in a significant military response. But the administration said on Thursday that the new revelation won't immediately change its stance on intervention. On the streets of Damascus, the two-year old conflict dragged on Friday, with government troops pushing into two northern neighborhoods, triggering heavy fighting with rebels as they tried to advance under air and artillery support, activists said. The drive was the latest in a days-long offensive by government forces in and around the capital, an apparent bid to secure Assad's main stronghold against rebel challenges. The Britain-based Syrian Observatory for Human Rights said the fighting between rebels and soldiers backed by pro-government militiamen was concentrated in the Jobar and Barzeh areas. The Local Coordination Committees, another activist group, said troops also bombarded the nearby neighbourhood of Qaboun with mortars and multiple rocket launchers.